The U.S. Drug Enforcement Administration (DEA) is set to ban kratom, an herb related to coffee. As early as Sept. 30, leaves from the tropical kratom tree, which grow wild in Thailand, Malaysia, and other parts of southeast Asia, will be categorized in the United States as a Schedule I controlled substance. Under the Controlled Substances Act, a Schedule I classification is reserved for drugs with a high potential for abuse and no medicinal value. Other Schedule 1 drugs include heroin, LSD, marijuana, ecstasy, and peyote. When asked how they would cope once kratom was made illegal, the majority of kratom users said they would turn to alcohol, opioids, or other easier-to-obtain illegal drugs to manage their symptoms. The agency said the move was necessary to “avoid an imminent hazard to public safety,” in an Aug 30 statement. Caught in the crosshairs of this sudden decision are the thousands of kratom users who rely on the herb for medical issues. A recent report by the Pain News Network found that among the over 6,400 kratom users who took their survey, over half said they used it to manage chronic pain. Others use it for anxiety or depression, and nearly 10 percent use kratom to overcome addiction to opioid drugs. Over 90 percent of users said kratom was “very effective” at treating their pain or other medical condition. But officials insist kratom won’t be gone for good. On Sept. 15, DEA spokesperson Melvin Patterson told the Washington Post that once kratom has been adequately studied, he anticipates it should be available again. “Kratom’s at a point where it needs to be recognized as medicine,” Patterson said. Kratom is a tricky drug to classify. At low doses it’s a stimulant, but at high doses it’s a sedative. It is not related to opium, but it does contain alkaloids that fit into opioid receptors to relieve pain. Kratom is related to coffee, but it does not contain caffeine. In Thailand, kratom is considered an addictive drug. But kratom advocates say that while users can develop dependence, the attachment to it is similar to coffee, with symptoms of irritability, and headaches as a result of withdrawal. In any case, kratom is not nearly as addictive, or as toxic to the body, as opioid drugs or alcohol, but it has been shown to darken the skin of chronic users. Long term use has been linked with weight loss, insomnia, and constipation. In Thailand, kratom users often chew the leaves to ingest the herb, but in the United States kratom is typically available as a powder available over the Internet and is used to make tea. 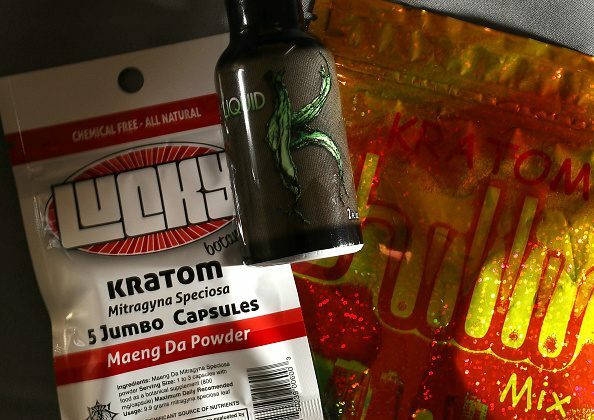 However, the quality of such unregulated imports can vary widely: some are pure kratom, while others are adulterated with opioids or other substances. The agency cites 15 kratom-related deaths between 2014 and 2016. However, all of those cases involve users who were taking kratom along with one or more heavy duty pharmaceuticals or other drugs. There is no documented evidence that shows kratom is fatal by itself. Overdose deaths from opioid drugs (both illegal and pharmaceutical), however, have increased 200 percent since the year 2000, according to a report from the Centers for Disease Control. In 2014 alone, over 28,000 U.S. drug overdose deaths involved some type of opioid. The botanical name for kratom is Mitragyna speciosa. The name comes from a 19th century Dutch botanist who thought the leaves looked like a hat worn by bishops (known as a mitre). However, up until the late 20th century, kratom was generally unknown outside of its native region. It was long recognized as a folk medicine for coughs and diarrhea, but it was banned Thailand in 1943, basically because it was cheaper than opium. Back then, the country was facing an economic downturn due to war with Japan, and the revenue the government had been making through taxes on the nation’s black market opium trade took a hit because kratom was a cheaper alternative. When officials realized consumers were turning to kratom and not their highly taxed opium, the Kratom Act was born, effectively criminalizing the tree. The herb is still a restricted substance in Thailand, and officials regularly bust operations trying to harvest and sell it. In 2012, officials called for the destruction of all kratom trees, but environmentalists prevailed. While dealing in kratom is discouraged, personal use is tolerated where the herb grows wild in the south. Before the ban in the mid-1940s, kratom was the drug of choice to farmers and laborers who used kratom much in the same way that Westerners drink coffee: a morning pick-me-up to power through a physically exhausting work day. For younger generations, kratom has become a vehicle for a more socially acceptable inebriation. A kratom-themed cocktail called 4×100 has emerged in the last decade. The drink is named after its four ingredients: kratom leaves, cough syrup, Coca-Cola, and ice. The cocktail has become a favorite among young Southeast Asian Muslims because it offers an experience similar to alcohol, without the stigma. The Quran technically shuns all intoxicants, but alcohol is met with the most scorn. There is a lot of false information about kratom. For example, a law in Indiana (one of six states where kratom is already banned) the leaf is falsely identified as a synthetic drug. It is not a hallucinogen, but heavy, long term use has been linked with delusional behavior. Like anything that promises extra energy and pain relief, kratom has potential for abuse, but it also offers an alternative to much more dangerous drugs. As early as the 1930s, people realized that kratom could help with opium addiction, and some believe kratom could help tackle America’s current opioid abuse crisis. For example, a study funded by the National Institutes of Health investigating the use of kratom as a remedy for opioid withdrawal prompted researchers to apply for a patent of a kratom alkaloid called mitragynine. Researchers believe this alkaloid could one day help users overcome opioid addiction without the standard avenue of treatment: using more opioid derivatives such as methadone. But the DEA’s strict classification will likely stall the process. While the agency says placing kratom in Schedule I will protect the public, others fear it will have the opposite result. On Sept. 26, a letter signed by 51 members of the U.S. congress called on the DEA to delay kratom’s restriction until there is ample time for public comment. “The DEA’s decision to place kratom as a Schedule I substance will put a halt on federally funded research and innovation surrounding the treatment of individuals suffering from opioid and other addictions—a significant public health threat,” states the letter.